There are few railway journeys in the United Kingdom that can match this route for interest and history. With a length of 130 miles journey takes around 150 minutes with Scotrail, East Coast and Cross Country all providing trains. Most of the route is close to or only a few miles away from the coast and it is no surprise that a journey will offer some excellent coastal view. If you have a choice of seats then the left hand side of the train facing the front is the ideal position. 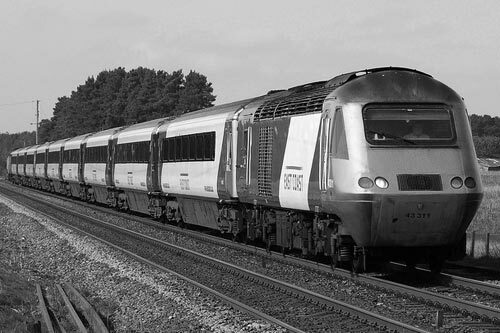 Photo - An East Coast HST heads south. Aberdeen is now an important centre of North Sea Oil after being a major fishing port. The station has all the normal facilities but derelict platforms show that it has lost some of its importance in the last fifty years. Boarding the 0952 service to London Kings Cross (arrive 1651) which is now named "The Northern Lights" my luck was good as I had window seats in first class at a very good discounted fare purchased a few months in advance. Departing the "Granite City" you soon get a view to the left over the busy harbour crossing the River Dee as you climb out of the city. Almost immediately you are high above the North Sea with excellent panoramas of the rugged coast. First stop is Stonehaven, with its lovely seaside location, where you turn inland for the next section of journey passing through undulating country as you head south. Arrival in Montrose is heralded with a view over a large expanse of water on the right - Montrose Basin - which is tidal and home to water birds in season. It is likely that you might be delayed here as the single line swing bridge is a bottleneck for trains. However any delay allows you to take in the busy harbour to the left which obviously is connected with the North Sea oilfields. Another section of coast beckons as the train speeds past Lunan Bay with the empty beach looking tempting on a warm sunny day. Sweeping inland again it is not long before the train reaches Arbroath home of the famous smokies (smoked haddock). The cliffs have disappeared after leaving the station but the view along the shoreline is good with a long sandy beach and sections of rocky foreshore. Passing Carnoustie (home to a famous golf course which has its own station) it is not far to the next stop at Dundee famous for fruit cakes and jute, this is Scotland's fourth largest city. Leaving Dundee the train turns left and crosses the River Tay. The original bridge opened in June 1878 but disaster stuck in December 1879 when a section of the bridge collapsed as a train was crossing. A replacement bridge opened in 1887 and this is the bridge that you are crossing. Piers from the old bridge can be seen on the left hand side of the train. Leuchars (for St. Andrews) is the next stop and home to a Royal Air Force base parts of which can be seen on the left. Continuing the route heads inland through undulating country to Kirkcaldy where production of linoleum (floor cloth) was once a major industry. After departure the railway follows the coast through Kinghorn and Burntisland. If you look carefully you may see seals sunning themselves on the rocks. On a sunny day you will also see people enjoying the seaside. The train soon reduces speed for a stop at Inverkerkeithing which lies on the north bank of the Firth of Forth. The railway threads itself through a rocky scene before bursting onto the Forth Bridge. Opened in March 1890 this spectacular construction in steel is rightly designated a UNESCO World Heritage site. The massive dimensions of the bridge only become apparent as the train steadily crosses high above the Firth of Forth. Wow! No superlatives do this bridge justice. Two and a half kilometres long some 64800 tons of steel were required in its construction. The railway deck runs 150 feet above the water and the edifice took eight years to build with some 4600 men employed to do the work. After such an exciting section of railway the remaining miles to Edinburgh are rather tame. However on the approach to Scotland's cultural capital you do get an excellent view of Arthur�s Seat - the volcanic hill rising above the western end of the city centre. One final station stop at Haymarket before the train trundles the remaining two kilometres to Edinburgh Waverley, the city's main station. En route you past beneath the ramparts of Edinburgh Castle on your right or below Princes Street Gardens on your left. Waverley station still retains some Victorian Grandeur with its extensive glazed roof. What next? Get back on a train and return to Aberdeen to see the things you missed on the outward journey!